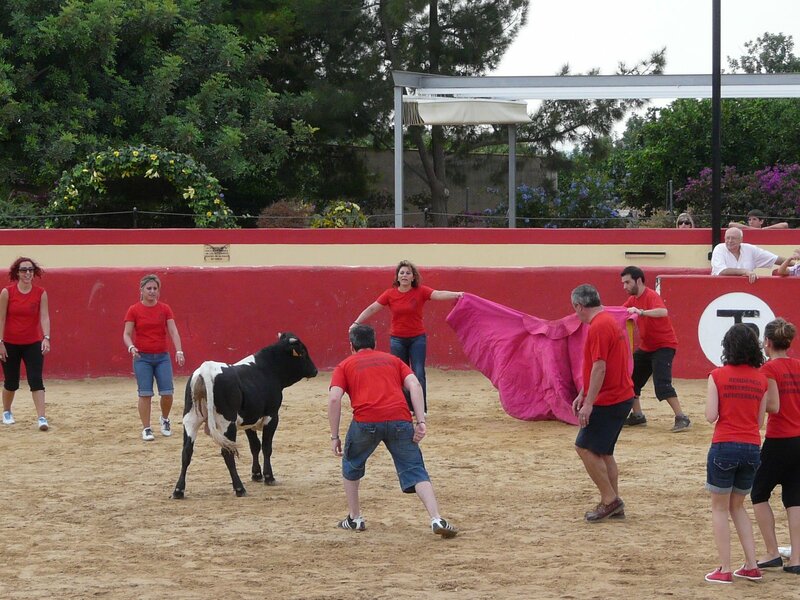 For what must be the most astounding activity Red Mago offers, our Baby Bull Running event is the most quintessentially Spanish experience you could ever have. Every year in small pueblos throughout Spain people will let loose some baby bulls in their main square to celebrate christenings, weddings or graduations. These capeas are festive occasions which mix a little bravery with a bit of fun. The most important thing to remember is that the baby bulls are not harmed and everyone has a good time. Our Baby Bull Running event takes place in a specially built arena which has lots of little nooks and escape routes for everyone to use if the bull is charg ing at them – running from a bull is very instinctive! 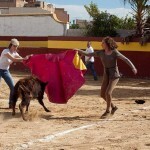 Our day of Bull Running starts when our private coach takes your group from your hotel into the countryside of Spain. 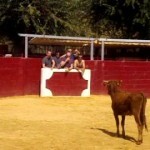 The arena awaits your group where an explanation of safety tips (to keep both human and bull alike safe!) and then everyone who is brave enough enters the ring. The excitement builds as the gate swings open and the first baby bull comes out! Sometimes it’s a bit of pandemonium, and sometimes there is a tense moment of stillness, but rest assured, bulls like to charge people! Abandon arena! 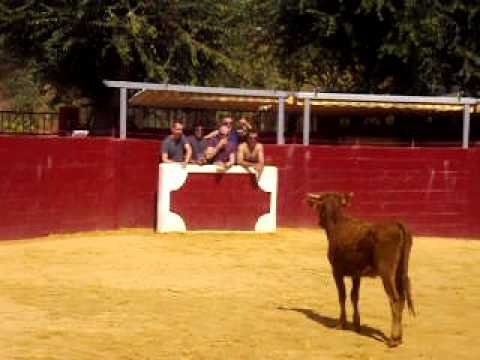 It’s over the wall with you, or a quick dash onto the raised platform in the centre – anywhere the bull IS’NT! 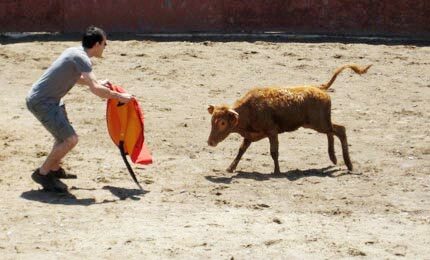 The braver among you will begin to see what the bull can do and get a little closer…red capes held aloft – the bulls really do go for red clothing! Olé! Whether you just jump in for a bit of a thrill, stay on the sidelines and watch the action or get in touch with your inner matador, the Baby Bull Running experience is simply incredible – an experience of a lifetime, and certain to create some truly entertaining memories. There is nothing more photogenic than a Baby Bull Running event! 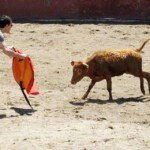 Contests of Human versus Animal are as old, if not older, than civilization itself! For most people this is their first experience close with an animal that isn’t either a pet or on a plate, and everyone gains a healthy respect for the power and intelligence of these majestic creatures. Baby Bull Running is an activity that is perfect for groups – the more people in the ring the more fun it is – for bull and human alike! There is certainly an adrenaline rush simply to be in the bullring and feel something like what the matadors of old felt like. The sense of exhilaration is important, but it’s important to also say that although the bulls are only babies, there is still a risk of injury – so keep your wits around you! 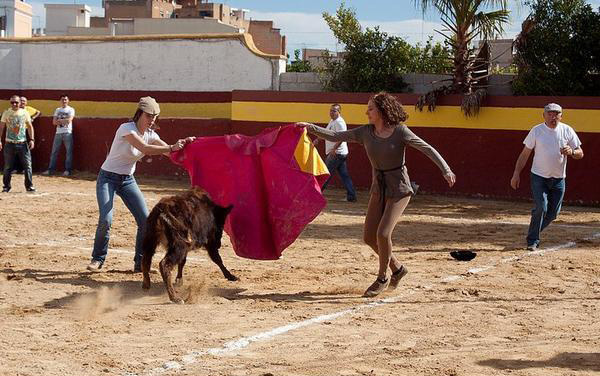 That said, Baby Bull Running is suitable for anyone who can walk a modest p ace – just enough to feel the thrill! When one baby bull tires it departs amidst applause and then another is let in. Each bull has its own personality (and size!) and then the challenge of getting close to the bull begins again! After an hour the event is finished- with smiles all around and unbelievable photo opportunities to share. Afterwards enjoy a classic paella lunch with a few beers under the Spanish sun and revel in what your group has just accomplished. No one at home will believe you! 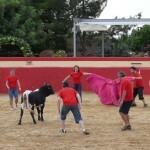 All in all, the Baby Bull Running activity will forge positive memories with your group. Bring them together and be able to proudly share having done this deeply cultural, entertaining and courageous accomplishment together! Viva España!